kt literary » Blog Archive » Congratulations to Kim Harrington and the Gamer Squad! Congratulations to Kim Harrington, whose new three-book series with Sterling Children’s Books was announced today! The full announcement is in Publisher’s Weekly Children’s Bookshelf, or you can check it out below. For more on the books, read on! After their scary adventure, Bex and Charlie have sworn never to play Monsters Unleashed again. Then Veratrum Games Corp releases a new AI game featuring aliens instead of monsters, and the best friends just can’t resist. After all, everyone loves it, even their science teacher, because it includes real star charts. But when they go to an observatory on a class trip, and open the game near a radio telescope, they get more than they bargained for: REAL aliens. One is sweet and kind; the other . . . not so much. Can Bex and Charlie capture the bad ET before it destroys their town? 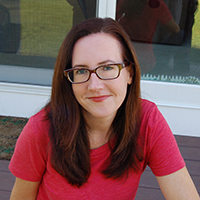 Kim Harrington is the author of the young adult novels Forget Me (Penguin/Speak), The Dead and Buried, Clarity, and Perception (Scholastic), as well as the middle-grade series Sleuth or Dare (Scholastic). She lives in Massachusetts with her family. You can pre-order copies on Barnes & Noble or Amazon, or ask at your favorite local bookstore. And please join me in congratulating Kim on Twitter @Kim_Harrington! ← Happy Book Birthday USA Today bestseller Ashlyn Macnamara!